We would like to take this opportunity to thank all of the people that helped make our 2019 Manitoba Social a huge success. Thank you to all of the people who purchased tickets and came out to support the social. Thank you to all of the companies who donated prizes, auction items and swag! You made the social an incredible evening. Please see the attached Thank you Poster with all of the contributing organizations. Thank you to all of the people who purchased prizes in the live auction. The live auction raised $17205.00 A Big Shout out goes to: Fraser Auction Services (Scott & Jesse Campbell), Bill Klassen Auction Ltd. (Bill & Karen Klassen) and Ritchie Bros. (Mason Richaud) for volunteering your time and energy in auctioning off all of the prizes. A special thank you to Minister Ralph Eichler and his team of spotters which included: Reg Helwer, Larry Maguire and Len Isleifson. Thank you to everyone who purchased 50/50 tickets. The 50/50 tickets raised $505. The winner of the 50/50 was Trevor Scherman and he donated $260.00 of his winnings back to AITC-MB. This year we decided to make Agriculture in the Classroom – Manitoba our recipient of the social profits because of our Theme of “Tell Your Story – Be An Agvocate” We still have to figure out all of the logistics but we are very proud to announce that Manitoba Ag Days will be presenting AITC-M with $28,055 from all of the social prizes that were donated by our exhibitors and friends. We would like to thank AITC-M for all of their work packaging and preparing the social prizes; it was a huge task and we are grateful for their help. 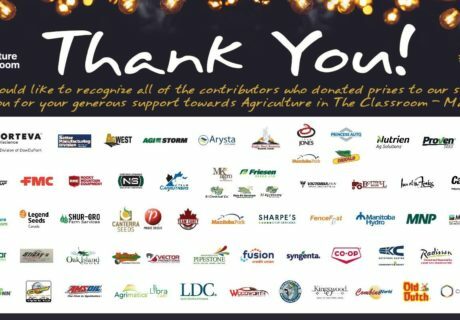 On behalf of the Management and Board of Manitoba Ag Days we would like to say thank you to our incredible industry!